Nerd alert! 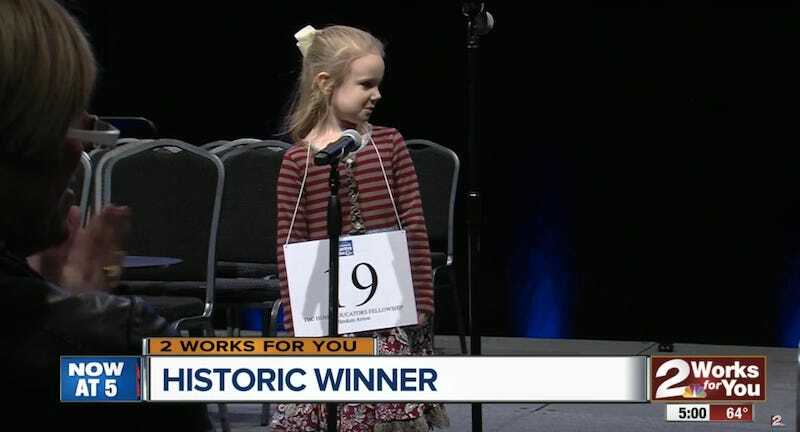 Edith Fuller, a home-schooled 5-year-old from Oklahoma, qualified for the National Spelling Bee after winning the Scripps Green Country Regional Spelling Bee Saturday. She will be the youngest-ever dweeb to compete in a national spelling bee. Edith won this weekend after correctly spelling “jnana,” a word of Sanskrit origin which means “knowledge.” That and $2.50 will buy you a cup of coffee, Edith. Although her delivery and mental fortitude are acceptable, Edith might have a glaring disadvantage. KJRH uploaded a few minutes of B-roll, and that gives her future opponents a lot of tape to study. Also, she’s five, and seems like she’d be frightened of abrupt sounds or intimidating situations, and probably cry. Admittedly, she does knock down “buddha,” “layette,” and “mesmerize” pretty easily. Edith was an early crowd favorite because of her age. But as she began correctly spelling words like odori, colloquial and sevruga, it became clear she was a true contender. Fuller said the family learned of her daughter’s knack for spelling last summer while they were having dinner together. The parents were quizzing the kids on spelling, and when Edith spelled “restaurant” without having been taught the word they were impressed. “We knew there was something special there,” Fuller said. Not to be rude, and by that I mean I’m going to be completely rude here, but “restaurant” is a pretty easy word to spell, even grading on a scale. That doesn’t explain the jump from common language to words no one would ever use outside of a spelling bee. Regardless, this kid should prepare for the increased competition. You’re in the bigs now, Edith. Once you hear that bell, it sticks with you forever. Have Spelling Bee "Winning Words" Always Been So Obscure?